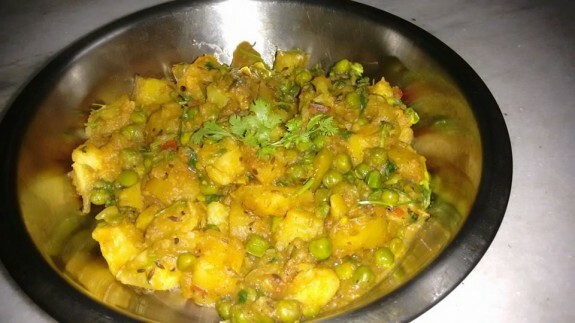 Aloo matar is a classic Punjabi dish where potatoes and green peas have been saute with spicy Indian masala. So, get this delicious Aloo Matar recipe at The Masala Route. 1. Heat a oil in a pan and add cumin seeds. Allow it to splutter. 2. Add pinch asafoetioda into it. 3. Add chopped onions and sauté it till onions are light brown in colour. Add ginger garlic paste and sauté for 3-4 mins. 4. Add turmeric powder and chopped tomatoes. 5. Stir the whole ingredients until tomatoes are softened. 6. Add red chili powder, coriander powder and salt as per taste. 7. Combine everything and cook for 3-4 mins more. 8. Add the cube potatoes and salt. Mix all the ingredients properly. (If you want, you can also light fry the potatoes at the beginning. However, it is optional). 9. Add 1 cup of green peas. 10. Stir everything and add water into this. 11. Cover this with lid and cook it for 10-15 mins until everything cooked properly and potatoes are soft and edible. 12. Add garam masla powder and remove it from oven. 13. Garnish it with chopped coriander leaves.